1 C None No Power Seat 1 C is an Economy Class Bulkhead seat. The close proximity to the lavatory and galley may be bothersome. The tray table is located in the armrest, making the armrest immovable and slightly reducing seat width. There is no floor storage for this seat during take-off and landing. 1 D None No Power Seat 1 D is an Economy Class Bulkhead seat. The close proximity to the lavatory and galley may be bothersome. The tray table is located in the armrest, making the armrest immovable and slightly reducing seat width. There is no floor storage for this seat during take-off and landing. 1 E None No Power Seat 1 E is an Economy Class Bulkhead seat. The close proximity to the lavatory and galley may be bothersome. The tray table is located in the armrest, making the armrest immovable and slightly reducing seat width. There is no floor storage for this seat during take-off and landing. 1 F None No Power Seat 1 F is an Economy Class Bulkhead seat. The close proximity to the lavatory and galley may be bothersome. The tray table is located in the armrest, making the armrest immovable and slightly reducing seat width. There is no floor storage for this seat during take-off and landing. 12 H None No Power Seat 12 H is a standard Economy Class seat that is missing a window. 14 C None No Power Seat 14 C is an Economy Class seat that may have limited recline. 14 D None No Power Seat 14 D is an Economy Class seat that may have limited recline. 14 E None No Power Seat 14 E is an Economy Class seat that may have limited recline. 14 F None No Power Seat 14 F is an Economy Class seat that may have limited recline. 15 C None No Power Seat 15 C is an Economy Class Exit Row seat that may have extra legroom. The proximity to the lavatory may be bothersome. The tray table is located in the armrest, making the armrest immovable and slightly reducing seat width. There is no floor storage for this seat during take-off and landing. 15 D None No Power Seat 15 D is an Economy Class Exit Row seat that may have extra legroom. The proximity to the lavatory may be bothersome. The tray table is located in the armrest, making the armrest immovable and slightly reducing seat width. There is no floor storage for this seat during take-off and landing. 15 F None No Power Seat 15 F is an Economy Class Exit Row seat that may have extra legroom. The proximity to the lavatory may be bothersome. The tray table is located in the armrest, making the armrest immovable and slightly reducing seat width. There is no floor storage for this seat during take-off and landing. 16 C None No Power Seat 16 C is an Economy Class seat where the proximity to the lavatory may be bothersome. 16 D None No Power Seat 16 D is an Economy Class seat where the proximity to the lavatory may be bothersome. 16 F None No Power Seat 16 F is an Economy Class seat where the proximity to the lavatory may be bothersome. 17 A None No Power Seat 17 A is an Economy Class seat that may have extra legroom. The proximity to the lavatories may be bothersome. The tray table is located in the armrest, making the armrest immovable and slightly reducing seat width. There is no floor storage for this seat during take-off and landing. 17 B None No Power Seat 17 B is an Economy Class seat that may have extra legroom. The proximity to the lavatories may be bothersome. The tray table is located in the armrest, making the armrest immovable and slightly reducing seat width. There is no floor storage for this seat during take-off and landing. 17 G None No Power Seat 17 G is an Economy Class seat that may have extra legroom. The proximity to the lavatories may be bothersome. The tray table is located in the armrest, making the armrest immovable and slightly reducing seat width. There is no floor storage for this seat during take-off and landing. 17 H None No Power Seat 17 H is an Economy Class seat that may have extra legroom. The proximity to the lavatories may be bothersome. The tray table is located in the armrest, making the armrest immovable and slightly reducing seat width. There is no floor storage for this seat during take-off and landing. 2 A None No Power Seat 2 A is an Economy Class seat that may have extra legroom. The proximity to the lavatory and galley may be bothersome. The tray table is located in the armrest, making the armrest immovable and slightly reducing seat width. There is no floor storage for this seat during take-off and landing. 2 B None No Power Seat 2 B is an Economy Class seat that may have extra legroom. The proximity to the lavatory and galley may be bothersome. The tray table is located in the armrest, making the armrest immovable and slightly reducing seat width. There is no floor storage for this seat during take-off and landing. 2 G None No Power Seat 2 G is an Economy Class seat that may have extra legroom. The proximity to the lavatory and galley may be bothersome. The tray table is located in the armrest, making the armrest immovable and slightly reducing seat width. There is no floor storage for this seat during take-off and landing. 2 H None No Power Seat 2 H is an Economy Class seat that may have extra legroom. The proximity to the lavatory and galley may be bothersome. The tray table is located in the armrest, making the armrest immovable and slightly reducing seat width. There is no floor storage for this seat during take-off and landing. 33 C None No Power Seat 33 C is an Economy Class seat that may have limited recline. The proximity to the lavatory may be bothersome. 33 D None No Power Seat 33 D is an Economy Class seat that may have limited recline. The proximity to the lavatory may be bothersome. 33 E None No Power Seat 33 E is an Economy Class seat that may have limited recline. The proximity to the lavatory may be bothersome. 33 F None No Power Seat 33 F is an Economy Class seat that may have limited recline. The proximity to the lavatory may be bothersome. 34 A None No Power Seat 34 A is an Economy Class seat that may have extra legroom. The proximity to the lavatory may be bothersome. The tray table is located in the armrest, making the armrest immovable and slightly reducing seat width. There is no floor storage for this seat during take-off and landing. 34 B None No Power Seat 34 B is an Economy Class seat that may have extra legroom. The proximity to the lavatory may be bothersome. The tray table is located in the armrest, making the armrest immovable and slightly reducing seat width. There is no floor storage for this seat during take-off and landing. 35 C None No Power Seat 35 C is an Economy Class seat that may have extra legroom. The proximity to the lavatory may be bothersome. The tray table is located in the armrest, making the armrest immovable and slightly reducing seat width. There is no floor storage for this seat during take-off and landing. 35 D None No Power Seat 35 D is an Economy Class seat that may have extra legroom. The proximity to the lavatory may be bothersome. The tray table is located in the armrest, making the armrest immovable and slightly reducing seat width. There is no floor storage for this seat during take-off and landing. 35 E None No Power Seat 35 E is an Economy Class seat that may have extra legroom. The proximity to the lavatory may be bothersome. The tray table is located in the armrest, making the armrest immovable and slightly reducing seat width. There is no floor storage for this seat during take-off and landing. 35 F None No Power Seat 35 F is an Economy Class seat that may have extra legroom. The proximity to the lavatory may be bothersome. The tray table is located in the armrest, making the armrest immovable and slightly reducing seat width. There is no floor storage for this seat during take-off and landing. 35 G None No Power Seat 35 G is an Economy Class seat that may have extra legroom. The proximity to the lavatory may be bothersome. The tray table is located in the armrest, making the armrest immovable and slightly reducing seat width. There is no floor storage for this seat during take-off and landing. 35 H None No Power Seat 35 H is an Economy Class seat that may have extra legroom. The proximity to the lavatory may be bothersome. The tray table is located in the armrest, making the armrest immovable and slightly reducing seat width. There is no floor storage for this seat during take-off and landing. 46 A None No Power Seat 46 A is an Economy Class seat that may have limited recline. 46 B None No Power Seat 46 B is an Economy Class seat that may have limited recline. 46 G None No Power Seat 46 G is an Economy Class seat that may have limited recline. 46 H None No Power Seat 46 H is an Economy Class seat that may have limited recline. 47 C None No Power Seat 47 C is an Economy Class seat in the last row of the plane that may have limited recline. 47 D None No Power Seat 47 D is an Economy Class seat in the last row of the plane that may have limited recline. 47 E None No Power Seat 47 E is an Economy Class seat in the last row of the plane that may have limited recline. 47 F None No Power Seat 47 F is an Economy Class seat in the last row of the plane that may have limited recline. This aircraft features shared overhead monitors. This Boeing 767-300ER aircraft seats 328 passengers in an all-economy configuration and is used on short to medium-haul routes. This aircraft is used only on very busy routes which justify carrying a large volume of passengers. There are 328 seats in Economy Class. Defo the best seats on this plane .All frount row have leg suport and a good relcline .A12 hour flight was very relxing but aextra £900 return . The general experience flying with Tuifly was horrible. The seats are way too small for the average person and are not at all comfortable for any flight longer than 5 minutes. The legroom on this particular configuration is WAY to small for an average human. My 4-hour flight from Menorca to Stockholm was one of the worst flights of my life. I had severe bruises on my knees after this flight due to the constant pressure from the seat in front of me. If you have to fly with this airline I would suggest a seat near an emergency exit so that you have some more legroom. Pre-booked this seat however those wanting a window seat should be aware that there is only an offset window looking backwards on this row. Any view is only achieved by turning sideways and being prepared to suffer a stiff neck. I recently flew to Arrecife with Thomson Airways prior to which I booked and paid for Seats 12A and B. I did so based on the planning configuration used by them on their internet booking system. Unlike your seat map relating to this aircraft they do not show that seat 12A is a bad seat in that it is missing a window. So beware people of this point if you book with Thomson Airlines. The only reason I book my seat is that I have the choice of selecting a window seat no one in their right mind pays extra cost to be without one . Although the flight was only 2 hours (LGW-PMI), the flight was packed and the flight felt very cramped as you were in a sea of people. 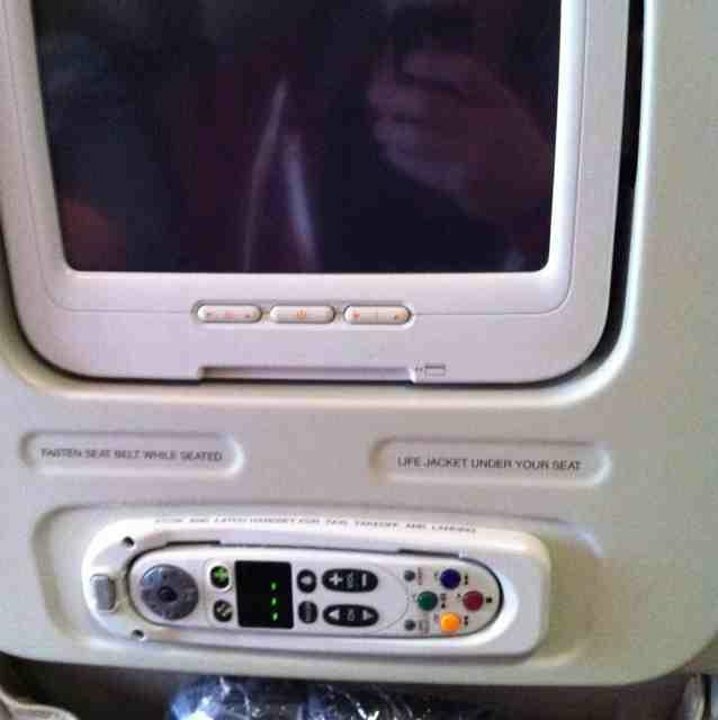 Meanwhile, every seat has a personal in-flight entertainment system which is a bonus, however as there is not a lavatory at the very back of the plane, you get a lot of people brush past the seat 39B and people are queuing down the aisle. A very nice aircraft though! Thomson flies 2 versions of Boeing 767-300ER (763).